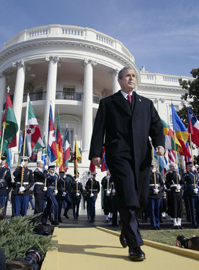 Has Bush overstepped his authority in fighting terrorism? President Bush's war on terrorism and his desire to wage war on Iraq are testing the constitutional system of checks and balances. While many of Bush's actions appear within his authority as commander-in-chief, some unilateral decisions regarding prosecutions of terror suspects appear in conflict with existing laws. Bush's insistence on blanket authority to pursue his policies also has stirred resentment in Congress, where Democrats and some Republicans believe they have been bypassed on key policy decisions. The administration says the unusual nature of the terrorist threat justifies the aggressive stance, arguing it needs maximum flexibility to confront a dangerous enemy. But given the open-ended nature of the war on terrorism, many lawmakers are contemplating how to regain institutional clout.